The Russian military, he said, had developed a number of significant new military systems. One was a nuclear-powered drone submarine that could be deployed to initiate nuclear strikes around the world. Another was a new form of hypersonic missile that is much harder to detect by defense systems. Those missiles, too, could be armed with nuclear warheads. 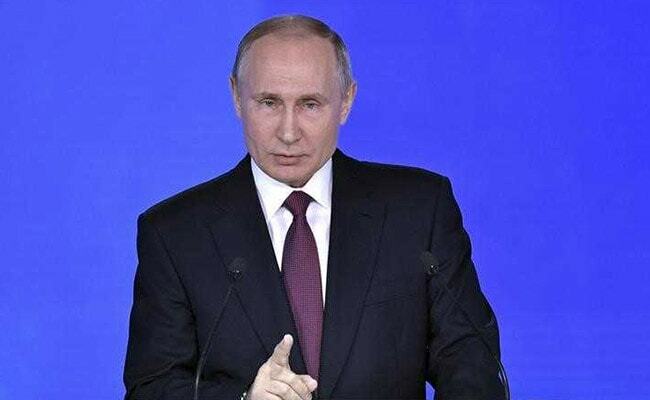 Standing in front of an enormous backdrop depicting an outline of his nation's boundaries - Crimea jutting out at the far left - Russian President Vladimir Putin gave his annual state of the nation address on Thursday. In the tradition of Steve Jobs's old Apple keynotes, Putin saved the major hardware announcements for the end. Most remarkably, Putin announced a new form of nuclear-powered cruise missile that also could initiate a nuclear strike. The advantage of using nuclear power for the missile is simple: Its range would be extended significantly. That extension is central to the geopolitics behind Putin's announcements. First, it is worth looking at the technology. Reuters' Gerry Doyle points out that the United States began development of a similar system during the Cold War. Code-named Project Pluto and tested in the evocatively named Jackass Flats, Nevada, it would have similarly added a nuclear-power system to a cruise missile, creating a device called SLAM, or Supersonic Low-Altitude Missile. Doyle noted on Twitter that a Russian test of a ramjet engine would probably have resulted in detectable radioactive particles, a function of the ramjet engine's design. (That was seen as an advantage during the U.S. design process: Not only could the missile deliver nuclear warheads, but it also could essentially act as a high-speed dirty bomb.) Interestingly, recent news reports indicate radioactive particles have been identified over northern Europe and Alaska. The Pentagon told Fox News' Lucas Tomlinson it was aware of a Russian test of a nuclear-powered cruise missile but the system was still under development and had recently crashed in the Arctic. So why announce the system now? To demonstrate to the West that Russia's strike capabilities were not going to be able to be contained by missile defense systems. "I hope everything that has been said today will sober any potential aggressor," Putin said. He showed a video mixing actual footage of a missile launch with an animated presentation of how one of the nuclear-powered cruise missiles might travel. Its ultimate destination in the video was a nonexistent island unsubtly located between Hawaii and the West Coast of the United States. But it is the route it took to get there that is important. At one point, traveling south through the Atlantic Ocean, the missile's path was depicted as weaving between two naval detection systems. That is the point: With no restrictions on fuel source and, therefore, no restrictions on flight distance, the missile could simply fly around existing detection systems, taking the long route around the southern tip of South America like a hyper-modern Magellan. "These are all programs that have been in development for a while," Middlebury Institute's Jeffrey Lewis, who also founded ArmsControlWonk.com, said of Putin's announcements in an email to The Washington Post. "All of them are about defeating US missile defenses." "For a while" meaning "since while before Donald Trump became president." In 2001, President George W. Bush withdrew from the 1972 Anti-Ballistic Missile Treaty that the United States signed with the then-USSR. (Putin - then in his first term as Russia's president - called the move "erroneous.") While Trump began talking even during the presidential transition about expanding the U.S. nuclear arsenal, that, Lewis wrote, was not why Putin was unveiling Russia's new systems. "The tone of the Nuclear Posture Review" - unveiled by the Trump administration formally this month - "made it easier for Putin to frame these programs as a response to US actions, but all of them have been underway for years," Lewis wrote. "This is more about Bush's decision to withdraw from the ABM treaty and the failure of either Bush or Obama to address Russian concerns about missile defense than it is about" the Nuclear Posture Review. In that document, Trump formalized his State of the Union pledge to build a nuclear arsenal "so strong and powerful that it will deter any acts of aggression." Putin's inclusion of Russia's new systems in his state of the nation address served as a rebuttal - but it was an announcement independent of Trump administration policy. "It took a while," Lewis said of the 2001 Bush decision, "but we finally got our arms race."